Al-Zaman (The Times of Baghdad) writes in Arabic that Sayyid Muqtada al-Sadr, leader of the Sadr Movement, returned on Wednesday to Najaf after 4 years in Iran. An aide issued a communique saying, “Muqtada al-Sadr arrived in Najaf in the company of a number of his major aides, among them Mustafa al-Ya`qubi, Muhammad al-Sa’idi, and Haydar al-Jabiri.” Sadr’s arrival coincided with a trip to Tehran from Iraq by former prime minister Ibrahim Jaafari, leader of the National Coalition. Jaafari is still in Iran. Sadr’s permission to return appears to be a reward to him by Prime Minister Nuri al-Maliki for his support of the new government, and a form of amnesty to him for his past rebellions against the Iraqi government (and against US troops). The US deeply dislikes and distrusts Sadr, who is among the most anti-imperialist Muslim leaders in the Middle East, rivaling Hizbullah leader Hasan Nasrullah in this regard. That al-Maliki allowed him to come back to Najaf is surely a little gesture of his independence from Washington as US troops draw down. Still, it is unlikely that Sadr will be all that powerful in the al-Maliki government. He has been excluded from powerful ministries. Sadr’s return to Najaf symbolizes the futility of George W. Bush’s war in Iraq, which achieved virtually none of its stated objectives. US troops died fighting the Sadrists in Najaf on two occasions in 2004. In fact, that was how Cindy Sheehan’s son died. But the Sadrs, Hakims, Sistanis and other great Shiite clerical families were always foreordained to still be there in Najaf long after the Marines had departed. Sadr arrived around 3 pm Wednesday afternoon. Eyewitnesses said that hundreds of people gathered before Sadr’s home and in the alleyways leading to it, welcoming him, amid extensive security arrangements on the part of police. Sadr visited the shrine of Imam Ali, the cousin and son-in-law of the Prophet Muhammad, whom Shiites consider the rightful successor to the Prophet. It is expected that Sadr will pay a reconciliation visit to Grand Ayatollah Ali Sistani and the other grand ayatollahs. He had trenchantly criticized them when the US military was investing Najaf in 2004, as the “silent leadership” (contrasting their quietism to his own vocal anti-imperialism). Sadr spent four years in Iran ostensibly finishing his seminary studies, but he had remained active in politics during this time, sometimes visiting Arab capitals and being received with honors. 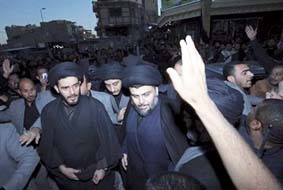 The newspaper maintains that Sadr is still wanted on a warrant related to the murder on April 9, 2003 of Abdul Majid al-Khoei, who had returned to the holy city where his father had been the primary grand ayatollah in the 1980s, in the wake of the US invasion and overthrow of Saddam Hussein. A mob had gathered, said to be Sadrists, and killed him, some say at Sadr’s order; others maintain that Sadr simply declined to intervene. I’ve heard rumors, however, that the warrant may have been quashed by the al-Maliki government, which is one reason Sadr felt comfortable in returning. Sadr’s support from last September forward was key to Maliki’s achievement of a second term. Sadr has dissociated himself from the criminal behavior of many militiamen in his Mahdi Army paramilitary, who conducted a massive campaign of ethnic cleansing of Sunni Arabs from Baghdad in 2006-2007, usurping homes and chasing people out of the capital in the hundreds of thousands. Sadr had been in conflict with al-Maliki from summer, 2007, when he withdrew from the latter’s government because al-Maliki would not set a timetable for US troop withdrawal. In March-June of 2008, al-Maliki launched a series of military strikes against Sadr’s militia in Basra, Nasiriya and East Baghdad– fighting that only ended when a truce was brokered by the head of the Quds Brigade (special ops) of the Iranian Revolutionary Guards, Qasem Solaimani. The Sadrists have 39 seats in the present parliament, out of 325 seats. They were given 7 cabinet seats, including Housing, Labor, Water Resources, State Minister for Tourism and Antiquities, and two ministers without portfolio in the government formed in late December. (Since the Sadrists are accused of looting antiquities on a vast scale and smuggling them, to support their militia activities, it is a little disturbing that they were given that ministry). Sadr is a force for intolerance in Iraqi society, and it remains to be seen if he has actually abandoned his predilection for use of coercive force. His followers have attempted to regiment women, close down video stores, close down cinemas, and prevent public performance of music. They have also targeted Sunnis and secular Shiites, neither of which will likely welcome his return to Iraq. On the one hand, Sadr’s return and his bloc’s participation in the Iraqi government is a sign of increased stability and might bode well for al-Maliki’s second term. The majority Shiites, including the Sadrists, have for the moment joined together and rallied behind the new prime minister. On the other, if Sadr goes back to promoting intolerance, he could be a force for disorder in a country and a political climate that already has enough of those. For more see this Bloomberg article, in which I am quoted.